to help keep the planet warm. We don't need another Ice Age. These days there is a law about most everything. Seems the government took a page from Baptist and Pentecostal preachers .... afraid that someone might be having fun! Many years ago, when people in the big cities first started to segregate their garbage for recycling purposes, a man name of williams who was a regular contributor to backwoods home magazine wrote that one "load" of the recycling plastics should be held back in reserve in northern climes for the purpose of emergency heating. "you all are right. although the gist of the article was about surviving a blizzard, the environment is too precious and, before you burn any plastics for emergency heat, you should first let your family freeze to death !" But ... lest folks think we are completely insensitive to the environment, I would like it to be made known that we DO recycle! At times anyway. Often a poopy diaper gets left in the yard .. and I won't pick it up until the dogs have thoroughly cleaned it. NOTHING goes to wast! Any sticks, leaves etc from trimming the plants in my garden goes in the incinerator. 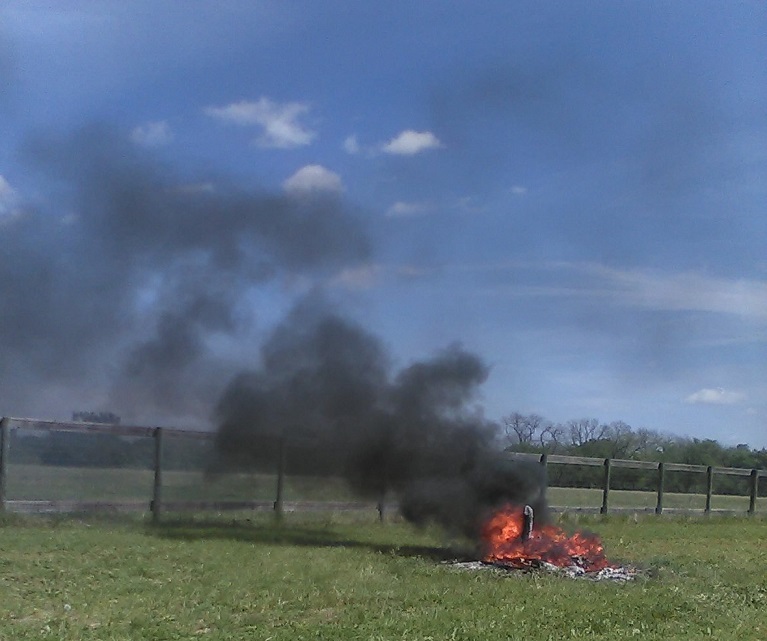 I also burn paper and cardboard products. Keeps the nutrients from my yard in my yard when I scatter the ash instead of removing it/plant material. A friend of mine who is VERY dedicated to conservation once told me "...environmentalists give conservationists a bad name..."
Jim....I agree.......while I do things that the picture shows I also. (Bite my tongue)...recycle.......the township picks up every Wednesday......no separating.......glass, plastic, metal, magazines/newspaper...just throw it in the buckets and leave it at the end of the driveway. Now, I'll tell ya why I do this.....I think I'm the only person in the township who does not have trash pick up. I ain't paying $30 a month for something I can do myself.......the above things get recycled, loose paper things get burned in the burn pit, all bad food gets thrown over the fence or out front....foxes come every night...they eat about everything........before they eat they knock on the door and ask if Nate is anywhere around. People today spend so much money they don't have to.....I also think I'm the last one in the township who cuts his own grass. No rodents around with those little guys around. I wouldn't harm one UNLESS I had chickens and a fox got into the chicken coop. They may be wild, and would do what they are born to do, they are fun to watch. "If you have ten thousand regulations you destroy all respect for the law"
Mandatory recycling here in VT. The powers that be are now finding there is a declining market for the recycled materials. There is much Pelosi about what can/cannot go in the blue bins it's a nightmare that defies all logic. Glass jars are OK but a broken window pane isn't. Tin cans are OK but any other metal scrap is verboten. But the enviro-Nazis are still pushing for more categories of materials to be recycled. Food scraps are now, or soon to be, on the list. People I know in the urban area south(Peoples Republik of Burlington) of us generally put their trash out the night before pickup day. It's gonna be a smorgasbord for skunks, foxes and free roaming dogs with what they don't eat scattered about from torn trash bags. If there's a problem with critters on trash day, put a splash of household ammonia in the bag or bin. The critters bite through and get a snoot full of NH3, and quit it. The ammonia breaks down into hydro and evaporates, and nitrogen which grow the plants. This,one was a couple of months ago..he is well fed. That is a faaaat Fox! I like foxes, too. I like all the canids. 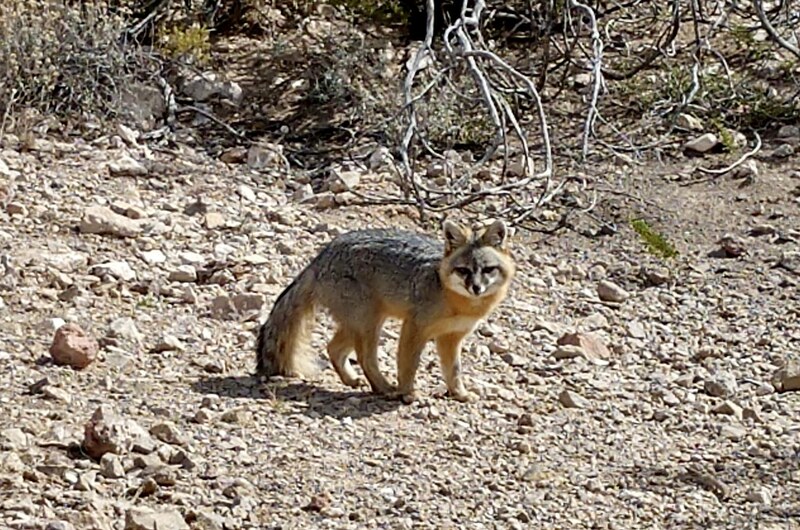 Here is a desert fox at the state park where I volunteer. Corgi's remind of fat foxes.